Over the last few years I have written quite a lot about forest succession. I have published a paper on the topic, have a paper in review about recovery of a forest under multiple stressors and will be starting more work on the it over the next few weeks. All in all, I think I have a reasonable idea what I’m talking about when it comes to succession, at least in forests. However, I’ve just read a paper on tropical forest succession that caught me a bit unawares*. The paper in question is Natalia Norden and colleagues’ work that was recently published in PNAS. The authors collected data from 72 secondary forest plots monitored for 7-24 years at 7 different sites across tropical South and Central America. They then used this data to look whether we can predict trajectories plot stem density, basal area and species density during forest succession after total clearance. On the whole the paper found that trajectories were poorly predicted by models that looked at change as a function of forest age. From the figure below, you can pick some general trends in the direction of change with age – stem density might have a humped relationship with age for example. However, it is also clear that there is a huge amount of variation and some trajectories bounce around all over the place. Observed successional trajectories of stem density, basal area and species density for the sites used by Norden et al. It’s obvious from looking at the figure above that the age of a secondary forest doesn’t really act as a proxy for its successional stage. In fact Norden and colleagues found that on average age only explains 20% of within site variation. Even if that is better than the average ecology paper, it’s still not very good. To explain the rates of change of different variables, Norden et al. fitted a set of different non-linear models for each site. Again, their findings emphasised the large amount of variation between different sites. Due to these idiosyncrasies, the authors of the paper see space-for-time substitution as a flawed method for predicting the dynamics of forests. They also suggest that such approaches should not be used for studies of succession of any sort of vegetation, arguing that previous work these methods has made succession appear as if it is deterministic, and it is not. Now I’m not sure how the numbers of studies that use chronosequences vs monitoring over time to study succession stack up, but I’d be willing to be bet >80% of these papers use chronosequences, at least in forests. There are good reasons for using them: they take much less time than monitoring (especially in systems containing long-lived organisms), they are much less expensive, the logistics are less complex and as a result of all of these things, they are easier to get funded than a 10-20 year research programme. Norden et al.’s warning against using chronosequences based on their results, begs the question “Do we have other evidence of how well chronosequences perform?” The answer is that we do, and it doesn’t look too good for chronosequences. For example, Ted Feldpausch and colleagues found that space-for-time substitution resulted in overestimates of biomass accumulation for young secondary forests in the Amazon. 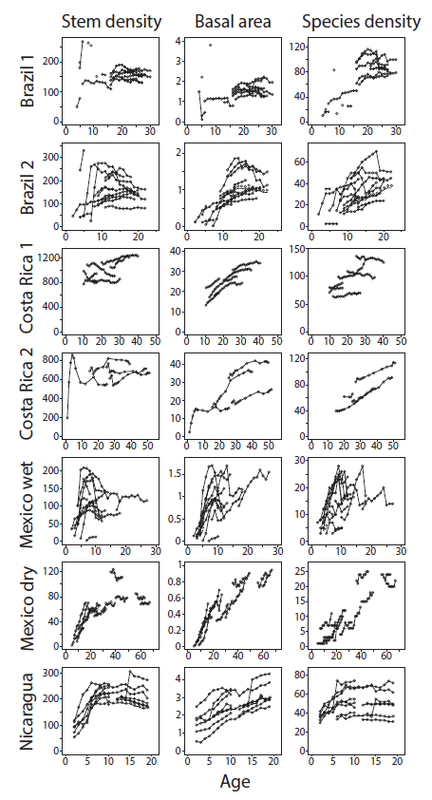 Recently Mora and colleagues similarly suggested that chronosequences were poor predictors of forest characteristics. How much variation in future dynamics do they actually predict? – Chronosequences are far from perfect, but it still offers us some insight into future dynamics. Mora et al. showed that chronosequences can still account for 32-57% of variance in future forest characteristics. There must be a reasonably large number of chronosequences that have been sampled more than once that could be used to test their predictive ability. We need more studies that address this head on. If it turns out that they are very poor at explaining future dynamics, then maybe it is time to switch to better methods. What variables do they predict most effectively? – Structural components of a system (biomass, stem density etc) should be easier to predict than community composition, since changes in structure are less likely to depend on idiosyncrasies such as the identity of initial colonising species. However, again, this has been tested relatively rarely. Do chronosequences have more predictive power in some systems than others? – Predictive power should be greatest when abiotic conditions are relatively constant across a landscape, disturbance history at all sites is relatively similar and in regions with relatively small species pools. Under all of these conditions there should be less chance of wildly different successional trajectories occurring. Where do animals fit into all this? – Predicting animal abundance and community composition is rarely studied in chronosequences, probably because their response to succession is that much less predictable than plant communities. Even though they are likely to perform relatively poorly, a comparison of the predictive ability of chronosequences for animal compared to plant communities would be interesting. What do you think? Are there any other questions we need to answer to determine the value of chronosequences? Or do you have any views on the use of chronosequences in non-forest systems? *To be fair, this probably shouldn’t have been that much of a surprise, review papers have been suggesting that chronosequences are far from the best way to do things for a while. Although, there are also papers that suggest that careful use of chronosequences is perfectly ok.